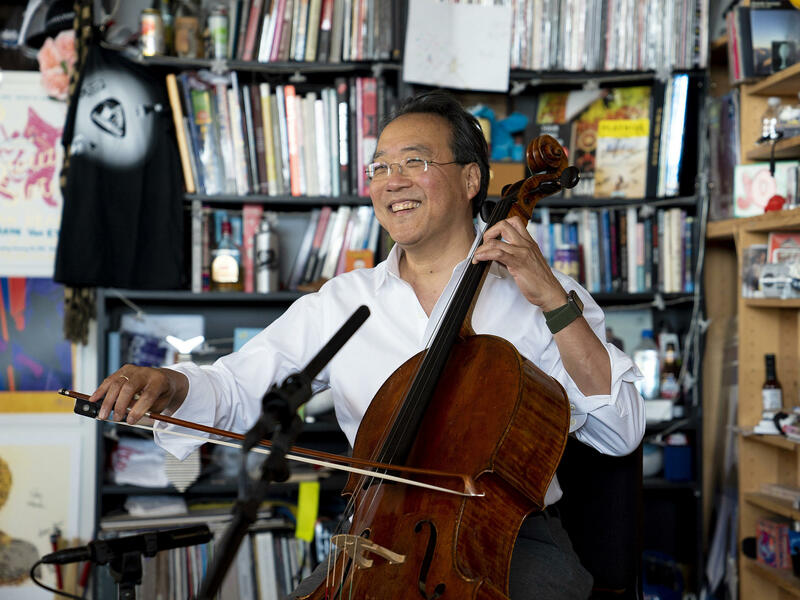 Yo-Yo Ma plays selections from Bach's Cello Suites at NPR Music's Tiny Desk. Ma and Bach's six Cello Suites have remained constant companions. The music — two-and-a-half hours of sounds that map humanity in all its triumphs, joys and sorrows — has become a lodestar for the celebrated cellist. Ma's first recording of the complete set won him a Grammy in 1984. He released another set in 1997, the result of collaborations with architects, ice skaters and Kabuki artists. And now, a third cycle of the suites has arrived, an album Ma calls Six Evolutions – Bach: Cello Suites. What could Ma be looking for in Bach's Suites now that he's reached his 60s? "You go for content," Ma tells NPR's Mary Louise Kelly in an interview held in front of Tiny Desk attendees immediately following his performance. "You try and transcend technique to get to what you think is there. Instead of saying, 'Here are these notes and this is difficult and I'm going to try and nail it,' you try to express it." The most expressive music Ma played during his all-Bach Tiny Desk was the "Sarabande" from the Suite No. 6. It's music that both soothes and celebrates, and Ma says he's played it in wildly divergent settings. "I've played this piece at both friends' weddings and, unfortunately, also at their memorial services." Ma, always curious, says that in returning to Bach he's also after perspective. "If you look at a statue from a different angle you'll see a different view," he explains. "I feel that's exactly what a musician, or a scientist — and I think of Bach as a scientist-musician — and what a news organization could do to bring all of the different perspectives of a globe together so we can actually make better decisions." One decision Ma has made, in conjunction with his new album, is to take the Suites on a two-year, worldwide tour, offering himself yet another set of adventures with the music that seems to soundtrack his life. "We go through these different evolutions," Ma says. "Each time you go through an evolution you're using all of what you learned from a previous evolution and applying it to your present state. So it's an additive thing, and I think that's what culture does." Bach's suites have undoubtedly played an important role in Ma's own evolutions. "Music," he said, "actually was invented, as all of culture was invented — by us — to help all of us figure out who we are." That is the sound of a spontaneous masterclass with one of the world's great musicians. KELLY: It's a hot, summer day. We are deep inside the NPR newsroom. Staffers, including me, are crammed into our music department for a performance, part of NPR's Tiny Desk Concert series. Musicians drop by, they play us a few songs or the Bach Cello Suites. MA: Believe it or not, this was the very first piece of music I started on the cello when I was 4 years old. One measure at a time. MA: (Playing cello). First day. KELLY: That is Yo-Yo Ma. MA: You get the idea. Now, all of you do homework - have done homework. MA: Some days, it's easier than others. So it's actually not painful to learn something if you do it incrementally. (Playing cello). KELLY: Yo-Yo Ma is out with a new recording of the Bach Cello Suites titled "Six Evolutions." He swears this is the last time he will record the complete suites. MA: I lived with this music for 58 years, plus four, that's my age. MA: You probably figured it out. So actually embedded in the way I play is, actually, everything I've experienced. So the next piece I'm going to play for you is Sarabande from the Sixth Suite. I play this piece at both friends weddings and, unfortunately, also at their memorial services. So it has a dual purpose. So think about that. (Playing cello). KELLY: When he was done playing, as the notes faded and his hands stilled, I got to slide into the chair beside Yo-Yo Ma and ask him a few questions - an honor, but I also had to force myself. KELLY: That was so lovely that I kind of hate to interrupt with any words or questions. MA: No, words are good. KELLY: I feel like we all just want to wander out and stay under that spell as we go about the rest of our day. Thank you. It's beautiful. MA: Oh, it's so great to play for all of you, even though the room is a little hot. KELLY: It's a little hot. We've got the sun coming. KELLY: I'm so interested by what you said about how you first played these particular Bach Suites when you were 4. And they've informed your life, and your life has informed the way you play them. It struck me as something we can all relate to. When I read a book in my 40s, now I find things in there I didn't find in there when I read it in high school. Is it the same for you when you play this? MA: Totally, it's exactly the same thing. And it's finding riches that a different perspective which age, obviously, brings. And I feel like that's exactly what a musician or scientists - and I think of Bach as a scientist musician and what a news organization could do to bring all of the different perspectives of a globe together so we can actually make better decisions. MA: I can tell you exactly what the person that's playing is going for. And I think, you know, language is a form of technique. But what you try and look for is not just to appreciate the technique, but the content. KELLY: So what are you going for now in your 60s? MA: So it's - you go for content. You try and transcend technique to get to what you think is there. So instead of saying, oh, here are these notes and this is difficult and I'm going to try and nail it, you're trying to express it. And I think we go through these different evolutions, as obviously you have. And each time you go through an evolution, you are using all of what you learned from a previous evolution and applying it to your present state. And so it's an additive thing, and I think that's what culture does. KELLY: ..Very sadly at the memorial service..
KELLY: ...You must've played it in a really different way - same notes, same music. MA: Same notes. I played it, I think, after 9/11. I've played it for really celebratory occasions. That's what something multi-dimensional can do. (Playing cello). KELLY: These particular six suites, you've recorded three times? MA: Yeah, I'm trying to get it right. KELLY: I think you're doing all right on that front. KELLY: But you've said this is the last time. Why? Are you done? MA: No, because I'm trying to think of these as - you know, trying to name them as six evolutions because I've gone through - what?- you know, I was an immigrant. Once you're an immigrant, you're always an immigrant, right? And once you go to college, you've always gone to college. And I've benefitted from all the things I learned there. I have a family. I have a wife. And so this is the evolution that I want to kind of stay with. And to think that music actually was invented, as all of culture was invented, by us to help all of us figure out who we are. (Playing cello). MA: Thank you so much. It's great to talk with you. MA: ALL THINGS CONSIDERED. (Imitating music). I'm done now. KELLY: All right. He's going to play us out on the ATC theme tune. KELLY: You can see the video of his Tiny Desk Concert at nprmusic.org. And lest you doubt, Yo-Yo Ma is a man of his word.